In the Philippines every big occasion or major events like weddings, birthdays, fiestas and even family gatherings a whole spit roasted pig at the centre of the dining table is a must. These roasted pigs are always the centre of attention, a masterpiece in a buffet table and everybody will queue up for its crispy skin and favourite parts like belly and leg. Having said that after the party there is a huge amount of leftover meat from unwanted parts this then does not go to waste as these leftovers are divided into the families that partake in the celebration as a takeaway. If the roast pig was huge then everybody can take home something but if not, only the celebrant’s closest family members and friends are going enjoy these leftovers. So what do they do with it? The answer is this recycled dish, the Lechon Paksiw. Lechon Paksiw, which means “Lechon” spit roasted pig and “Paksiw” to stew in vinegar, it’s the most appropriate name to describe the cooking process for this dish. 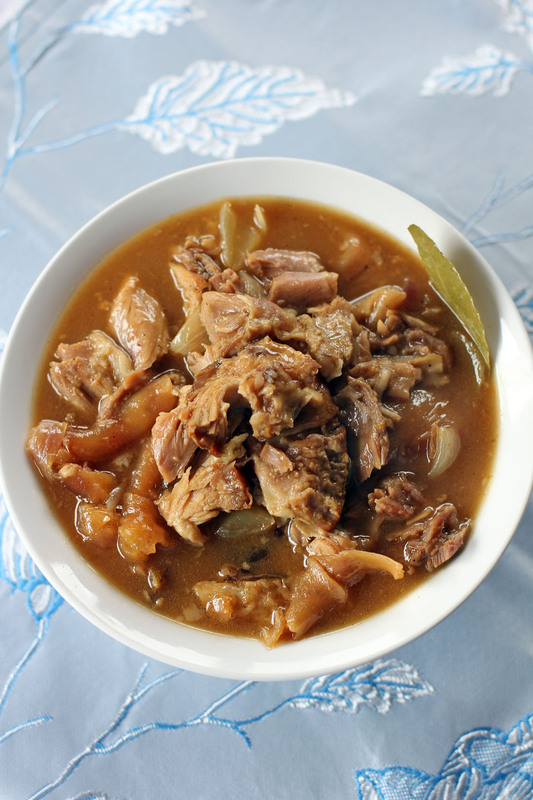 Basically the leftovers like the bland meat and soggy chewy skin is slowly simmered with bones in vinegar and lechon sauce the sweet and spicy liver gravy that usually accompanies the roast pig which results to this fork tender meat in sweet, spicy and sour sauce. I know bland roasted pig leftover, liver sauce and vinegar does not sound enticing but trust me when you combine all of them together it’s phenomenal. Sometimes Filipinos crave for this dish but we don’t want to wait for a big occasion to have left over roasted pig so we sometimes improvise by roasting pork in the oven or even deep frying it to attain that crackling pork skin texture and use Mang Tomas Sauce instead. 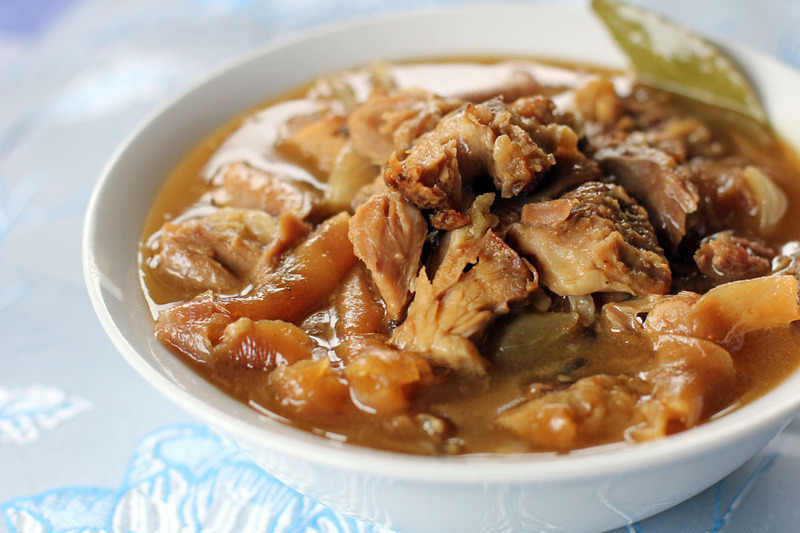 A truly authentic Filipino dish that is a must try for those who loves sweet and sour recipes. Pat dry the pork leg roast using paper towels, rub salt all over and place on a roasting pan skin side up. Bake the pork in a preheated oven at 160C for 1½ hrs. Remove from oven then let it cool. Bake pork again in 180C preheated oven for 30 to 45 minutes or until skin becomes crispy like lechon. Remove from oven, cool it down in a wire rack then cut into bite sized cubes. In a pot add oil then sauté garlic and onion for a minute. Add the cubed pork, the bone, water, vinegar, Mang Tomas sauce, soy sauce, sugar, peppercorn and bay leaves, bring to a boil and simmer for 45 minutes or until pork is fork tender and sauce is thick. Add water if necessary. Flavour with fish sauce and season with lots of freshly ground black pepper. I’m excited to try this. I live in the heart of LA, but haven’t had much of a chance to try Filipino food. I’m going to make this this weekend! my kids like this i”m going to cook this tomorrow. thanks..
Yum! What is in Mang Tomas sauce? I like to make most of my sauces from scratch if possible, I wonder if I can recreate a similar flavor. Basically its pureed pork liver, bread crumbs, vinegar, water, sugar, onion, garlic and cornstarch mixed together and cooked until thick. Taste would be a mixture of sour, sweet and savoury. Hey Raymund! I read your post this morning before work today and by lunch I actually found and purchased a bottle of a Mang Tomas sauce. I hope I bought the right one… It had a yellow label and is 19.40 ounces and it said All Purpose Sauce. Is it the right one? Thanks! Yes thats the one. Let me know how it goes. BTW that sauce is good dip with roast chicken as well, treat it likr ketchup or barbecue sauce. Awesome! I now know what new dish we are trying this weekend :)! Thank you! This sounds quite tasty! I’ve never heard of Wang Tomas sauce so thanks for the link. Great dish! Geez I used to drive all the way to New Manila (I forgot exactly where) to get some lechon every weekend almost. I will try it this coming weekend here in Alaska thanks! Wow in Alaska, it must start to get cold there now. I can’t understand why you’d stew this instead of roasting it on a spit – you lose out on the crackling !! 🙂 This still looks delicious though. I can imagine the flavours. It is meant for leftover roast pig where people already had devoured all of the crispy bits.